You are here \ South Africa Weddings \ Tie The Knot \ Wedding Services \ Wedding Dresses \ Is Pink The New White? Blush gowns are in. According to anyone worth their salt in the ₤10bn wedding industry. Certainly they’re a trend amongst celebrities. Jessica Biel just got married in a pink Valli bridal gown, Anne Hathaway married Adam Shulman in a hand-painted pale pink Valentino gown, Reese Witherspoon did it in pink, as did Gwen Stefani (even if hers was only dipped in pink at the hem). And fashion houses Versace, Elie Saab and Chanel all showed pink wedding gowns in various hues, at the 2012 Paris haute couture fashion shows. The 2013 season will see pink move up from simply a thought or an accent colour to the ‘star of the runways’. Does that mean other brides will follow suit? Assuming we follow trends (and we do) then you can expect to see a lot more brides in coloured, and certainly pink, dresses. They’re not called pink gowns, though. You may need to adopt the term now in favour to describe them rather as ‘blush gowns’ – probably a more apt description anyway, as very few of them are obviously pink. Take a closer look at Anne Hathaway’s breathless gown and it looks white with a hint of pink, and even Jessica Biel’s dress barely makes it into the pink palette. It’s been described as watercolour or petal pink. The major theme is that weddings have moved away from the white gown and into the colour arena. Despite this fashion gurus say the gown still needs to look like a wedding dress if you want to look the part of the bride. And if you’re going to do colour, the important thing is to find a colour that suits you. Dress designers suggest that blush and champagne tones are naturally more flattering against the skin. Brides often struggle with white, as it can be rather harsh. In fact, very few brides wear absolute white – many have opted for champagne, ivory or shell instead. Now pink and other hues give brides more options. 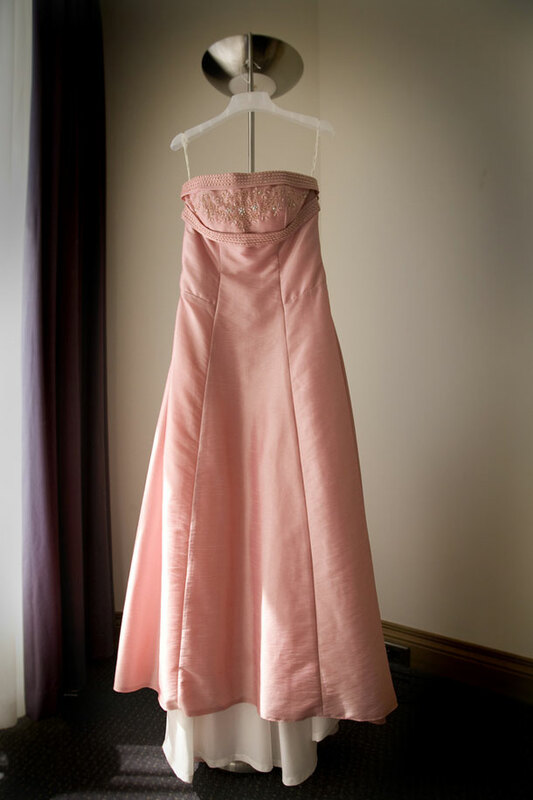 Would you wear a pink wedding dress? If you can get past the programming that brides must get married in white, try to choose a subtle shade of pink – there are some utterly gorgeous light shades of pink – enough to make any girl drool. What are brides wearing in 2012?